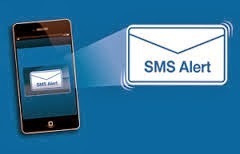 The Reserve bank of India has asked the banks to charge the customers on the actual usage bank for the SMS alert instead of fixed charges per month. This will ensure the rationality of charges. "Banks are advised to leverage the technology available with them and the telecom service providers to ensure that such (SMS) charges are levied on all customers on actual usage basis," the Reserve Bank of India said in its Second Quarter Review of Monetary Policy 2013-14. It said fees based on actual usage are necessary to ensure reasonableness and equity in charges levied by banks. In March 2011, the RBI had set guidelines for banks to send online alerts to customers for all types of transactions, irrespective of the amount. However, the central bank had not issued rules on charging customers for these alerts. Banks started imposing SMS alerts charges around 4-5 months ago but the charges rate are different banks to bank. State bank of India also joined the race imposing Rs. 60 per month for the SMS alert. All private banks are also imposing charges for the SMS alerts on mobiles.